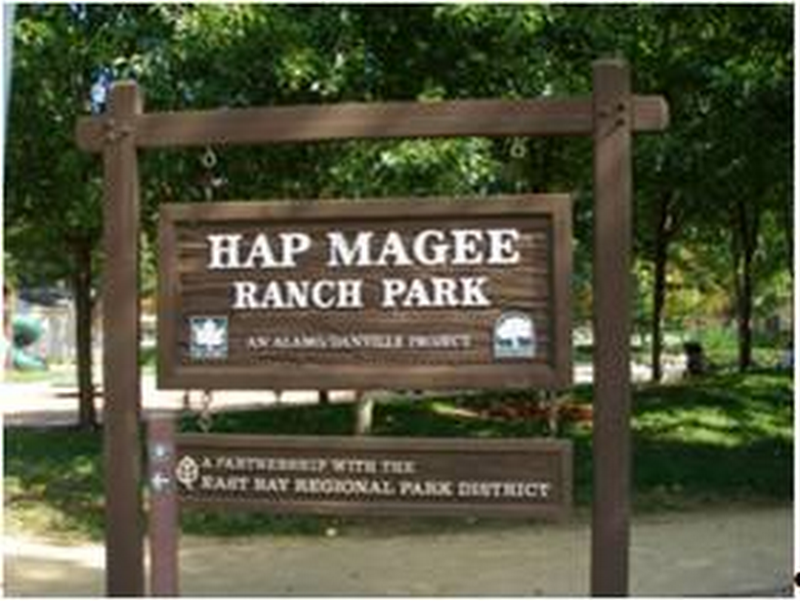 Hap Magee Ranch Park is a 16.3 acre park jointly owned by the Town of Danville and the community of Alamo (Contra Costa County). The park is unique in the San Ramon Valley for its historic buildings, informal recreation uses, location on a major regional trail, artistic memorial sites and Alamo-Danville governance. Many parks in the valley are beautiful with mature trees and special design features, but Magee successfully captures a rustic sense of place. In 1874, Captain Isaac and Ann Trasker Swain left a bequest to the San Francisco Protestant Orphanage Asylum to buy a warm summer camp for the orphans, away from San Francisco's damp summers. In 1911, a camp was purchased on part of the Hemme property in Alamo to fulfill this bequest. The orphans came to the valley from 1911 to 1946, using the train and then buses. They brought their bedding and a few belongings. At first they lived in tents but eventually several facilities were constructed including a boys house, a girls house, a round building (called the Rotunda) and a swimming pool. Today two of the former Camp Swain buildings have been re-named the Cottage and the Swain Houses. There are many charming stories about the children’s summers in the valley. In one, the children raised their own rabbits all summer; at dinners the last week each child took great care not to eat his or her own rabbit! You hear so much about! So come and help us out. So we can swim about! Harry and Juanita Magee were the next owners. 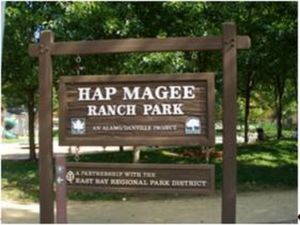 Their son, Hap Magee, was a local cattle rancher and story-teller extraordinaire. He and his new wife Ruth moved into a new house (now the Magee House) in 1953. When the freeway was built in 1962-64, the land was graded extensively. Many people today still recall the jackpot calf-ropings Hap hosted for the public on the northern part of the property. After he passed away in 1985, an option for the property was purchased from Ruth Magee by the Trust for Public Land (TPL) in 1986 and held until 1987. The property was purchased from TPL by the County of Contra Costa (on behalf of R7A in Alamo) and the Town of Danville in 1987, each owning a half undivided interest. The Joint Powers Agreement is dated May 22, 1987. A joint Danville-Alamo) committee was set up to oversee the development and operation of the park. Both entities committed to provide equal amounts of funds for Magee Park's planning, development and support. Planning for the park began immediately and the Master Plan was adopted in 1988. The Plan states that the park should retain and build upon the historic/western character of the site and allow only informal sports activities. Two historic houses on the site have been gradually restored and maintained, an ongoing process. Danville staff lived in and restored the Swain and Magee houses which are now available to be rented by the public. For over a decade the YMCA rented the Cottage and provided a regular presence in the Park. The East Bay Regional Park District installed a steel bridge (for walkers, bikers and equestrians) over San Ramon Creek in 1993 which connects the Regional Las Trampas to Mount Diablo Regional Trail. Artists designed the Orphans' Memorial Drinking Fountain and the Indian Commemorative Site which were both constructed in 1997. An elaborate children's play structure with a ranch theme is tucked into the property near the historic cottages and includes a sand volleyball court, popular water elements and covered picnic tables. A 1 1/2-acre off-leash large and small dog park with turf, the Canine Corral, is open north of the cottages. The Danville Sycamore Valley Rotary installed a traditional gazebo in the park which is often used for weddings. In 2013 the Bounty Garden was installed to produce produce for local food banks. Magee Park is a lovely gem of a park. With the development of the play structures and dog park, a “passport” tour which brings third graders to the Indian commemorative site and a wedding gazebo and a regional trail, the park serves a wide variety of park visitors well. Hap Magee Ranch Park Master Plan (May, 1988); newspaper clipping; JPO documents; Lynn Yaney’s article “Once They Called It Camp Swain”; Danville staff reports.